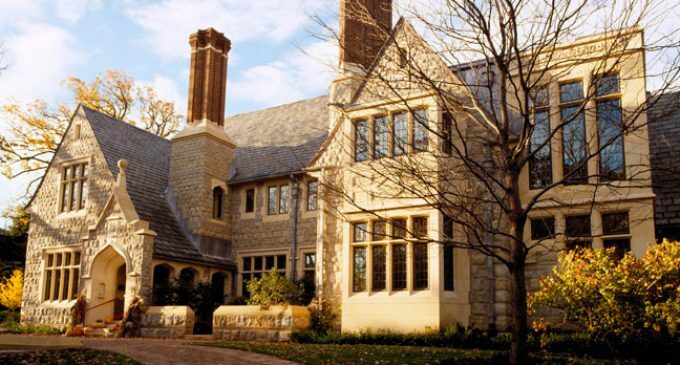 With its stone exterior, slate roof and towering brick chimneys, this custom 10,000 square foot residence in Glencoe, Illinois has all the makings of a grand old English manor. The incredibly detailed mansion was designed by Chicago-based architectural firm Liederbach & Graham Architects LLP for Alec Litowitz, founder of Magnetar Capital, and wife, Jennifer. A 2008 article in Chicago Home and Garden reveals that the design was inspired by Little Thakeham, an authentic English manor in Sussex designed by famed architect Edwin Lutyens in 1902. Interior designers Heather G. Wells and Bruce Fox joined the project before heading to the English countryside for inspiration. The result of the collaboration of accomplished designers and architects is a fabulous new home with all the appeal and quality of the past. The interiors are filled with European antiques and feature rooms such as a walnut-panelled dining room with two limestone fireplaces, a double-height library and a charming kitchen with pizza oven. Jennifer Litowitz told Chicago Home and Garden, “We built it first and foremost for our kids. Nothing is off limits.” The grounds include a manicured sports lawn, a columned pergola, interesting garden ornaments and a walled-in swimming pool.